This kitchen was dark and lacked storage space and cooking zones. It was due for a major overhaul and HKB Designer Andrea Woodall was brought in to accomplish the homeowners’ goals: an open concept with a beautiful island. Our experienced team removed the wall between the dining room and kitchen and installed new Luxury Vinyl Tile flooring throughout the space. The new sophisticated kitchen is light and open, with a tile backsplash and Napole granite countertops that unify all of the wood products. 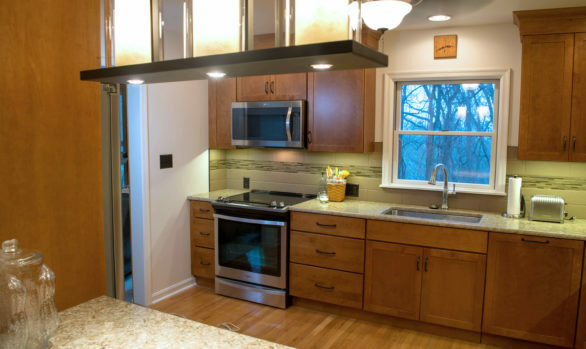 Overall, the newly remodeled kitchen has a modern aesthetic with abundant storage. We also improved the laundry set-up in an adjoining room. Interested in remodeling your home?